The bicentennial celebration of Lermontov’s life and work places emphasis on shared cultural values as a means to resolving diplomatic differences. Mikhail Yuryevich Lermontov, the Renaissance man, was celebrated this month, lauded not only as a poet and novelist, but also as a skilled painter, a visionary, and even a prophet. Born in 1814 and killed in a duel in 1841, Lermontov was not only recognized for his talents in his lifetime, but the strength of his work as a Romantic poet and amateur painter resulted in a legacy lasting 200 years after his birth. The American-Russian Cultural Cooperation Foundation (ARCCF) hosted an evening at the Library of Congress in the author’s honor. ARCCF executive director, Alexander Potemkin, emphasized a point that would be repeated throughout the evening that sharing of cultural values such as literature often acts as the “first signal of warmer times.” Cultural diplomacy was one of many factors that helped end the Cold War, said Potemkin, the last cultural attaché in the Soviet Embassy and the first cultural attaché under the new Russian Federation. Lermontov’s bicentennial was a long awaited celebration, said Potemkin. He explained that exactly one hundred years after Lermontov’s death, Russia tried to celebrate this anniversary, but World War I started. A celebration was also thwarted 125 years after the author’s death when Russia was fighting World War II. The ambassador pointed out what a significant contribution the 26-year-old author had on Russian culture, literature, art and cinema and expressed his hopes for the upcoming cohort of Russian and American scholars. During his life, Lermontov’s writing was so powerful and his voice so influential that his poem about the death of Pushkin (which placed the blame on the state for the poet’s death) led to his first exile in the Caucusas. His words still hold sway over audiences today. Known best for his novel “Hero of Our Time” and for poems such as “Death of a Poet and The Sails,” Lermontov was a multifaceted artist. To celebrate his diverse talents, a wide variety of mediums were used to honor the author. Part of the opera based on Lermontov’s poem “The Demon” was performed, along with musical renditions of several poems sung by countertenor, Terry Barber. 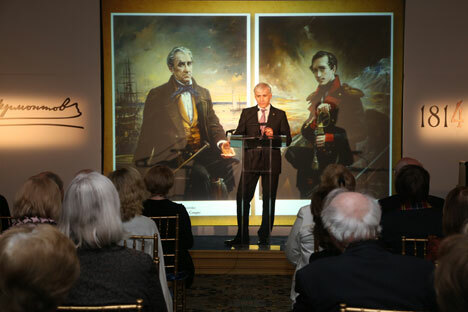 Vassily Nesterenko spoke about the two portraits he painted and displayed for the event: one of Lermontov and one of James Fenimore Cooper, whose books about the American frontier were often a source of literary inspiration for Lermontov. Nesterenko spoke about Lermontov’s natural talent as a painter. Had he not died so young or focused so much on writing, Nesterenko believed that Lermontov could have gained great fame with his art alone. The living Lermontov wore a Scottish tartan scarf, representing his family’s heritage before they were Russian nobles. Dr. Nikolai Zlobin, author of the book America – What a Life and founder of the think tank, Center on Global Interests, pointed out that not very many people are aware of Lermontov’s connection to Scotland. Potemkin added that one hundred and fifty years after the poet’s death (1964), Khrushchev stepped down, and now 200 years later when relations between Russia and America are tenuous, Potemkin was worried that once again something would inhibit the celebration.